The Zydeco Dots are a fun-loving, hard working, talented Houston based group that plays a dancin’, rockin’, bluesiana blend of Zydeco rhythm and blues. They perform regularly in Houston at Shakespeare’s Pub, The Firehouse, and Pappadeaux Restaurants. They also tour the region and are well received in San Antonio, Port Arthur, Beaumont, and Lafayette. Their many festival credits include the Waterfront Festival, Old Town Spring Festival, the Italian Festival, Fun Day in the Park, and Party on the Plaza. Their unique brand of music was featured at the last many Houston International Festivals, the last several Mardi Gras, and the Texas Crayfish Festival. The Houston Press has chosen them Zydeco Band of the Year six years in a row. They play parties at the Petroleum Club, The Bayou Club, Briar Club, Magnolia Ballroom, Champions Country Club, Del Lago, as well as in Brenham, San Antonio, Jefferson, Wharton, Galveston and around the state. They have shared the stage with Buckwheat Zydeco, CJ Chenier, Beau Jocque, Zachary Richard, Terrance Simien, Wayne Toups, as well as with Fats Domino and Doug Kershaw. They were honored to perform for the President at the 1990 Economic Summit and were asked to throw out the pitch for an Astros game kicking off the Bayou Bash. No event is too large or too small. Laissez Les Bon Temps Roulez!!!!! What do you get when you set inspiration, motivation, and education to music? If you guessed the hottest artist to hit the youth entertainment scene, you guessed right. Jace Blain is beyond determined as a recording artist. “Charismatic, energetic and dynamic”, an artist that successfully blends “Music with a Message”. His songs are more than mere music; they create a call to action. He empowers youth to take charge, control, and responsibility of their lives. Looking for motivation…well, you found him! Here to stay, Jace has performed at a multitude of Festivals, Schools, Churches, and Family Events. This undeniably proves that his style of music is truly universal. Jace Blain has helped elevate rap from just urban poetry to a voice of movement. He has transcended from a Hip-Hop poet to social linguist. Leaving you with this statement, “I’m just trying to add some substance to Children’s Music”. Houston-based choir Brian Dunlap & Total Praise raise their voices in gospel song. They have accompanied Lyle Lovett and his large band on tour, winning accolades from audiences and music critics alike. Check out what our beloved Houston Press had to say about Brian Dunlap & Total Praise. Houston’s most exciting POLKA band, Polish Pete and The Polka? I Hardly Know Her Band, started delighting audiences on Ground Hogs Day in 2012! 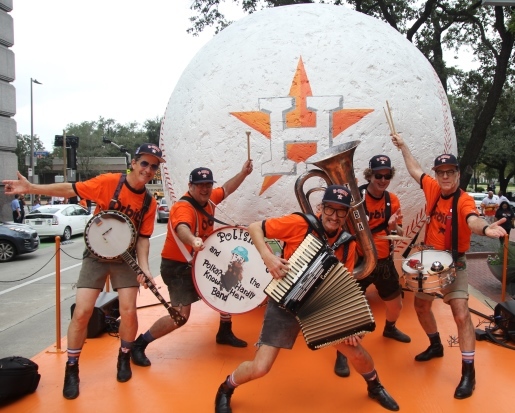 In 2017, Polish Pete’s Polka propelled the Houston Astros to their first World Series Championship and was invited to perform in the World Championship Parade in front of one million Altuve Polka loving fans! After multiples appearances at SXSW and the best parties anywhere, Polish Pete, combined his love of Houston, The Astros, Jose Altuve, baseball, and beer halls, to write his newest smash hit, THE ALTUVE POLKA, to honor one of Houston’s biggest heroes!